Hard Disk Drive Quantity 1 x 320 GB, SATA II, 5400 RPM, Internal, 2.5"
Viewable Display Diagonal Length 18.5"
Hard Disk Drive Quantity 1 x 320 GB, SATA II, Internal, 2.5"
Viewable Display Diagonal Length 15.6"
Hard Disk Drive Quantity 1 x 500 GB, SATA III, Internal, 3.5"
Hard Disk Drive Quantity 1 x 500 GB, SATA II, Internal, 2.5"
Hard Disk Drive Quantity 1 x 320 GB, SATA, Internal, 2.5"
Viewable Display Diagonal Length 20"
Hard Disk Drive Quantity 1 x 500 GB, SATA III, 5400 RPM, Internal, 2.5"
HP ProOne 400 G3 20-inch Non-Touch 20" diagonal HD+ anti-glare WLED-backlit All-in-One PC, FreeDOS, Intel&reg; Core&trade; i3-7100 with Intel&reg; HD Graphics 630, 4 GB DDR4-2400 SDRAM (1 x 4 GB), 1 TB 7200 rpm SATA, 1g. 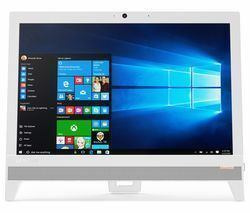 HP ProOne 400 G3 20-inch Non-Touch 20" diagonal HD+ anti-glare WLED-backlit All-in-One PC, FreeDOS, Intel® Core™ i3-7100 with Intel® HD Graphics 630, 4 GB DDR4-2400 SDRAM (1 x 4 GB), 1 TB 7200 rpm SATA, 1g. Hard Disk Drive Quantity 1 x 500 , SATA, 5400 rpm, Internal, 2.5"